Last year at this time we were all preparing for the arrival of the National Grange in Cromwell. This year we can relax for a new hosting committee is in charge. Connecticut will still have a small delegation attending National in Grand Rapids, Michigan. All of the Granges should have started planning their year's activities. In your plans you should include your advertising campaign for the year. This should include getting your meeting announcement in the local newspapers as well as spreading the word to all your friends and neighbors. For those Granges that own their own halls, do the residents in your town know where your hall is located? One of the best ways to advertise its location is by placing a large Grange Emblem on the front of the hall. The National Grange Store has a 21" by 26" Town Marker Sign available for $30.00 plus shipping. All of the halls I have seen have the name of the Grange posted on them, but only a few have the Grange Emblem as well. Another method of advertising the Grange is by making posters and placing them in the windows of your local stores or supermarkets. One of the best places to put these posters is near the store's entrance or exit. Those members that have access to a computer can use them to make their posters. If you need assistance in getting started making these posters, just contact me. 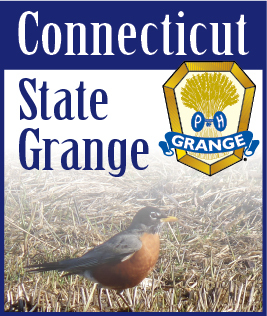 E-mail: publicity@ctstategrange.org.